DC Improv hosted for the first time The Liar Show tonight. The unique live show features four storytellers, three of which are recalling true events that happened to them. The fourth storyteller is lying, but the audience doesn't know which. After they tell their comedic tales, the audience has a chance to grill the storytellers and try to find holes in their stories. Add to this that a portion of the audience is bound to be intoxicated at this point in the night, which guarantees some interesting questions. If you guess the right person to be the liar at the end, you have a chance to win a T-shirt. Or something. A great show and a nice change of pace from the celebrity stand-up acts at this comedy house. Recommended! Velocity Five opened its doors in Courthouse a few months ago. 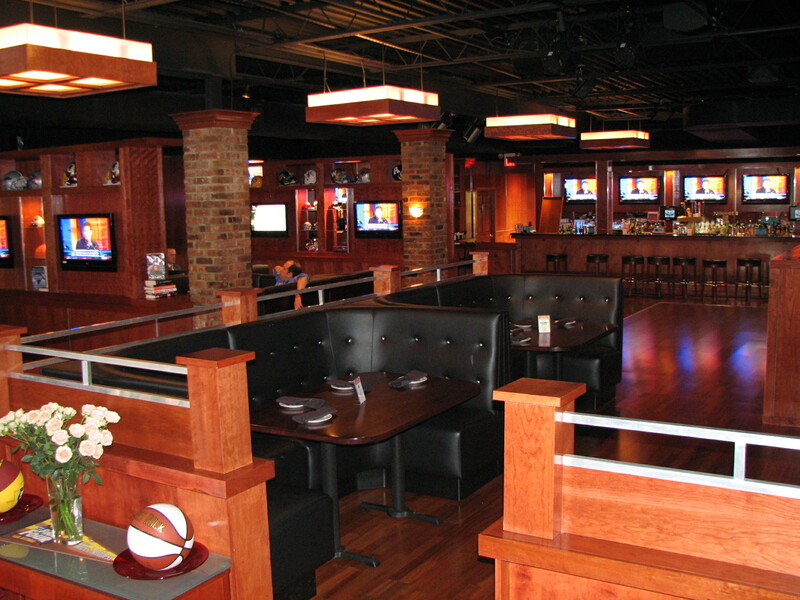 Its a typical northern Virginia sports bar that attempts to be more upscale than other typical northern Virginia Sports bars. It has some nice outdoor setting, and is smoke free. But that hasn't saved it from the mediocre reviews on Yelp. The best thing this sports bar has is its location near a metro station, as well as being strategically located across from Ray's the Steaks. That upscale steak house is definitely worth visiting, especially when they have their $20 soup and steak and desert special available. The third and first non-DC location of the popular Busboys & Poets venue is nested in the Shirlington town center. The restaurant portion features some great dishes. They have interesting twists on classic sandwiches and the french fry wedges are extremely delicious. There is also a bookstore portion to the restaurant if you feel like feeding your mind as well. Open mic poetry readings every Monday night at 8pm keep the spirit of the Langston Hughes-inspired venue alive. The spectacular indoor Kogod courtyard housed the Bemcha jazz ensemble tonight. The free concert was well attended and featured a variety of instruments filling the airy area with relaxing music. 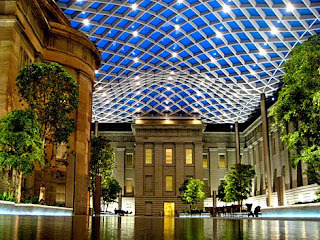 The Smithsonian venue has classy events like this almost every day in the courtyard that combines Greek architecture and modern lines. 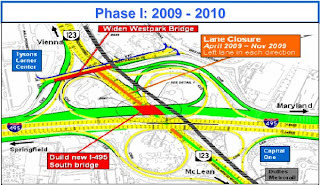 The mega project of expanding the choked highways and adding a new Metro station to Tyson's Corner has begun. 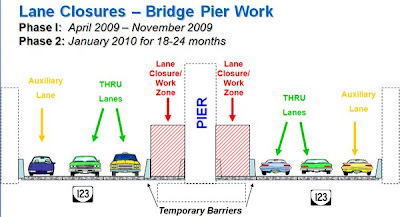 And things are going to get to get worse long before traffic gets better, if it ever does. 123 is losing lanes and 495 is sure to slow down here. Try to avoid both. Actually, try avoiding commuting anywhere in Northern Virginia until flying cars are invented. The left lanes in each direction of Chain Bridge Road (Route 123) under the Capital Beltway will be closed until November as part of a project that will add four new high-occupancy toll (HOT) lanes to the Beltway. My favorite band of all time Metric is blessing us with their new album this Tuesday April 14th! 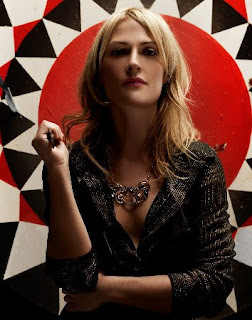 Fantasies includes 10 tracks are available now for digital downloading, but the luddites among us will have to wait to the 14th hear Emily Haines' beautiful coos on CD. Their music video for their new song Gimme Sympathy has generated some controversy on YouTube as people are debating how they shot the entire set in a single take. Yeah Yeah Yeahs on SNL tonight! Yeah Yeah Yeahs are making their first appearance on Saturday Night Live tonight! I'm really excited to see the popular indie art punk trio perform on TV, as I've never seen them live. Some dude from High School Musical (whatever that is) is hosting the show. They will probably play tracks from their freshly released album "It's Blitz!" I'm looking forward to see what type of colorful outfit Karen O will be sporting tonight! Emo/indie talent Acacia Sears entertained the Dupont crowd at the famous Kramerbooks & Afterwords cafe tonight. Her acoustic music has a very chill and heartfelt melody, although her tunes were overshadowed by the din of conversation in the cafe. I think she would recieve better apprecaition at a venue like Iota. Beautiful weather, if a little windy at times, brought lots of people out to the city tonight. Add to that the North Carolina and Villanova game was on along with a bar crawl tour filled up all the sports bars. Clarendon was reasonably populated but not packed tonight, with Eleventh featuring a DJ in the basement encouraging people to dance to the repetitious techo/house beats. 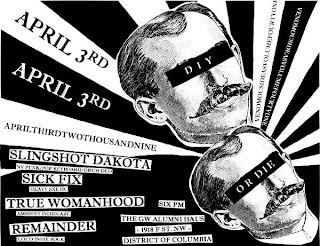 True Womanhood played with many other indie-hipster-punk-skinny jeans bands tonight at GWU's Alumni House. This was the first of this type show at the F Street club, which usually hosts formal dinner events. Unfortunately TW was plagued with bad luck tonight, with Tom's glasses and keyboards breaking, and soon after an amp decided to die. They still remained in good spirits and I'm looking forward to their next show at the DNA Fest hosed by Velvet Lounge on the 24th. They claim they can't afford the rent anymore. And there might be tax issues. Very sad, as it was a nice yuppie hangout and good anti-establishment alternative to Starbucks. Murky will be reincarnated as Wrecking Ball Coffee at 5th & H Streets NW, two blocks east of the Chinatown Gate. Thanks to Miles Grant for the info.